If you can garden this time of year in the mountains, it’s a treat. Harvesting the last of the chard, delicada squash, and herbs. Collecting seeds for next years garden dreams, transplanting, moving, and degrassing flower beds. It’s more or less playing in the dirt, a soul kind of day. 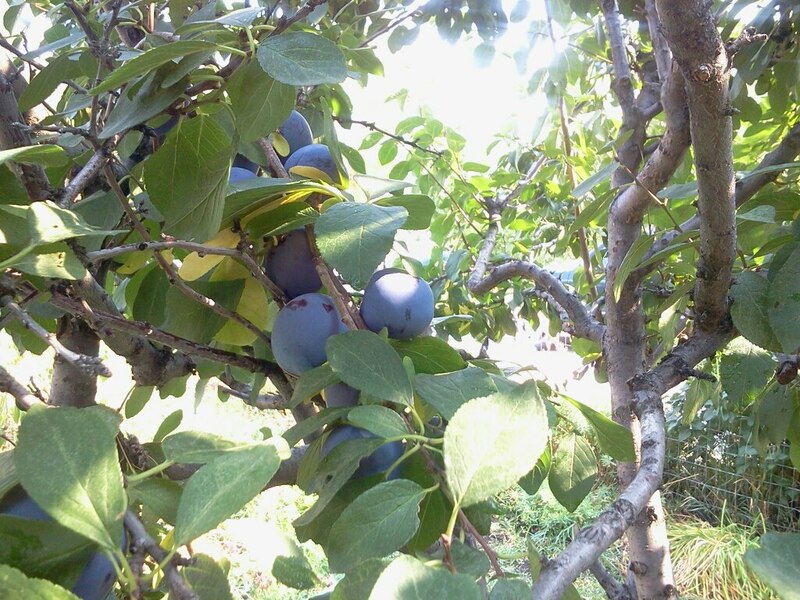 The only thing that makes it better for me is our plum tree, a Royal Mountain Blue Plum tree to be exact. 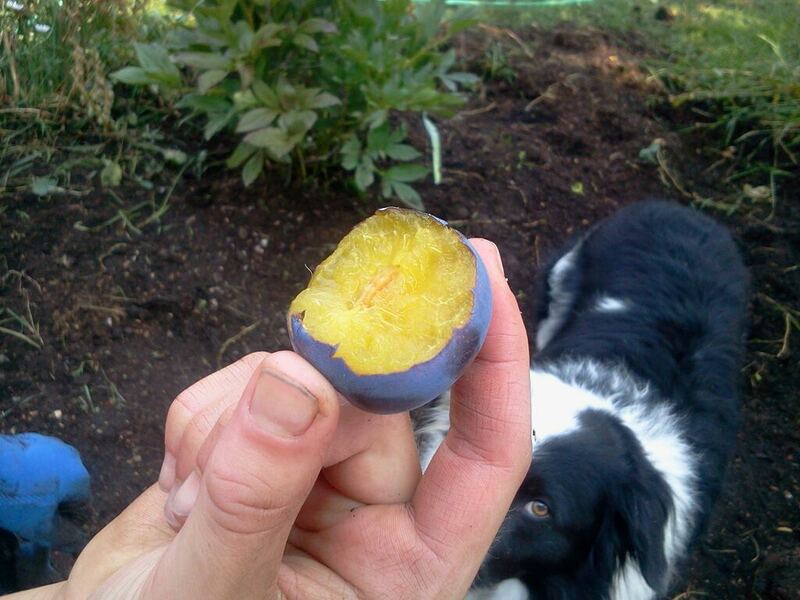 We only need one cold night in September to turn our plums from garden goodness, to gifts from the garden gods! So sweet, so delicious, perfectly firm but with a slightly soft texture. Absolutely perfect! Working in the dirt and being able to reach up every now an again to grab one of these gems, well it kind of makes me smile! 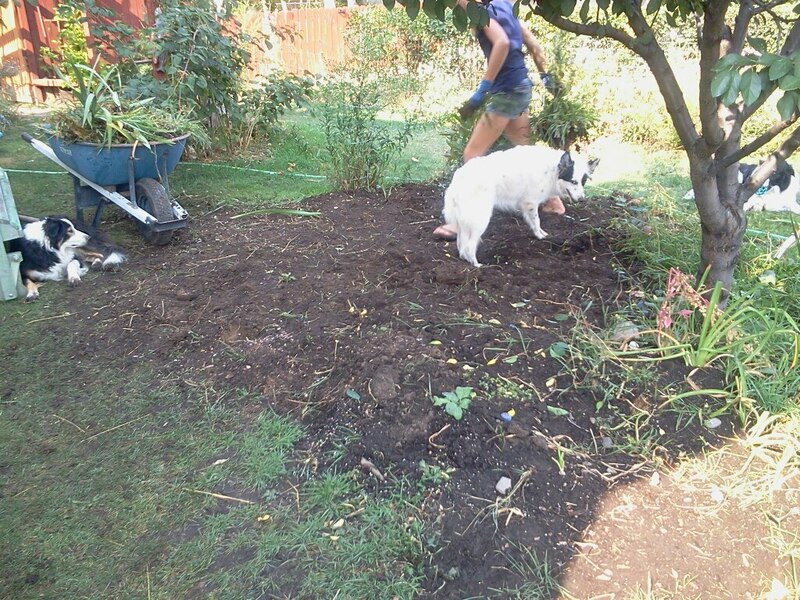 Today we dove into the garden bed around our plum tree. We dug up 31 perennial plants, some tulip bulbs, and some volunteer daisies. I’ve been wanting to open up this space and move more of our lavender in this area. I had some great help with Pip, $eeker, Story and Ocean. Ocean is my digger and it is actually a job for her. 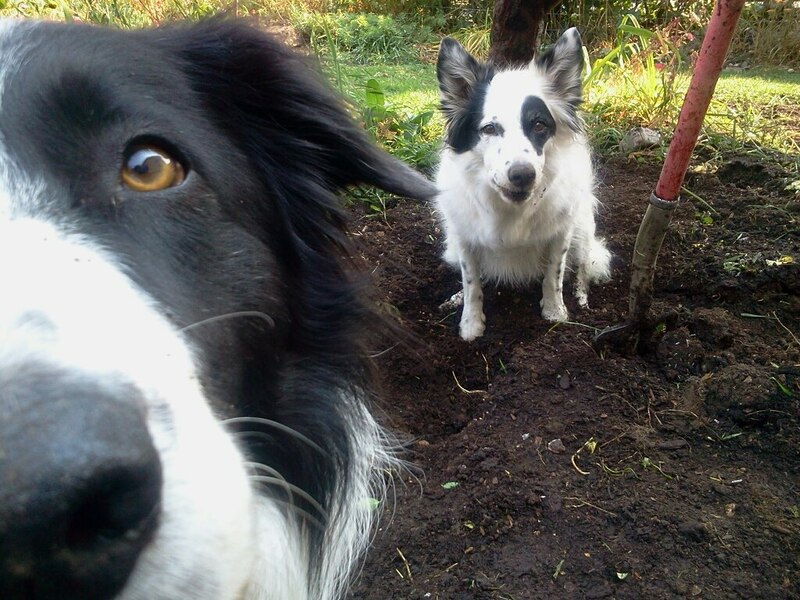 When I need a hole in the garden we work together on it. She is invaluable with this talent. 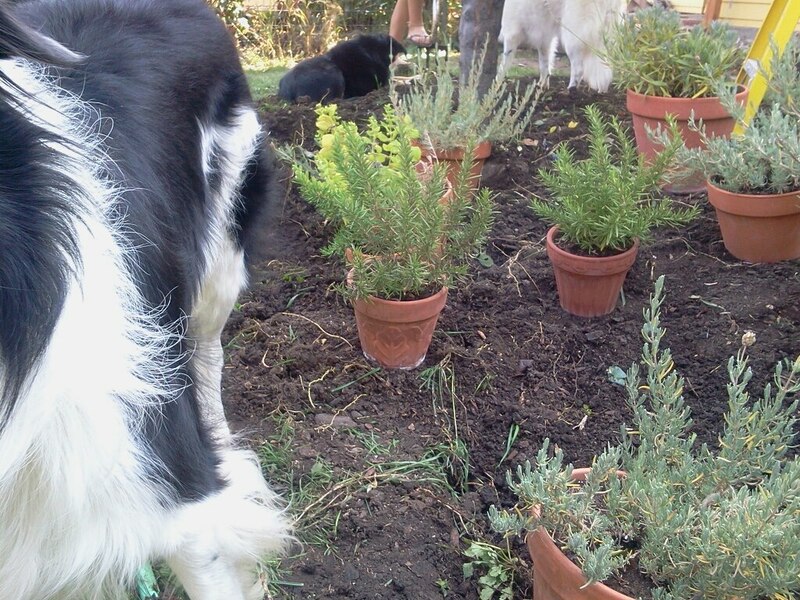 We needed seven holes the size of the lavender bundle in the photo, and she kept at it until we were done! Pip just has to say, “where’s the mouse?” and Ocean goes at it. 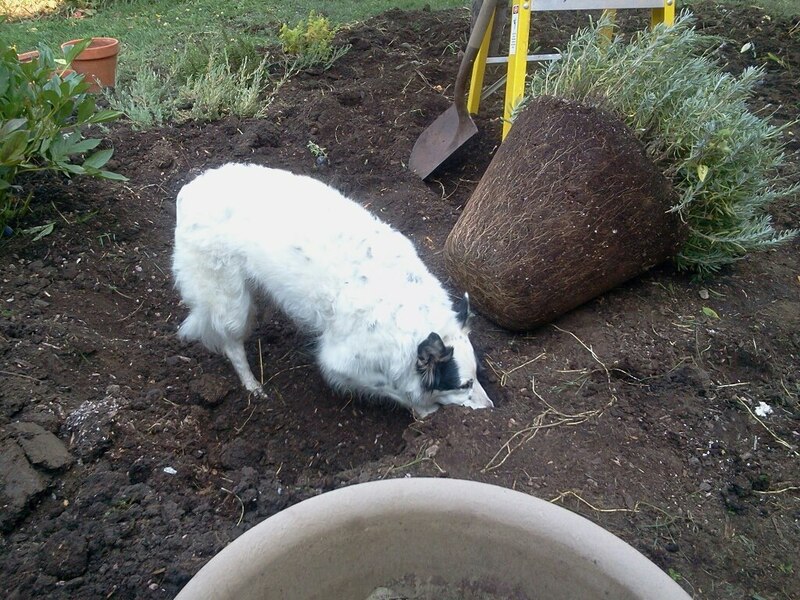 I’m pretty sure Pip wouldn’t find gardening nearly as fun if she didn’t’ have Ocean to work with. Our traveling pots of rosemary, lavender, and lemon balm found their winter home today… I’ll be curious to see if the Spanish, or Otto Quast lavender makes it in our growing zone. I have a feeling our winter, if we actually have one this year, will kill it. It’s my new variety experiment. Nine wheel barrels full of perennials that we dug out of this space. Many went into our seed plant pile. One day that pile is going to be the most gorgeous garden we have! My Franny hanging and overseeing everything. She loves a full warm day outside. It has to feel good on her bones these days. Garden partners. 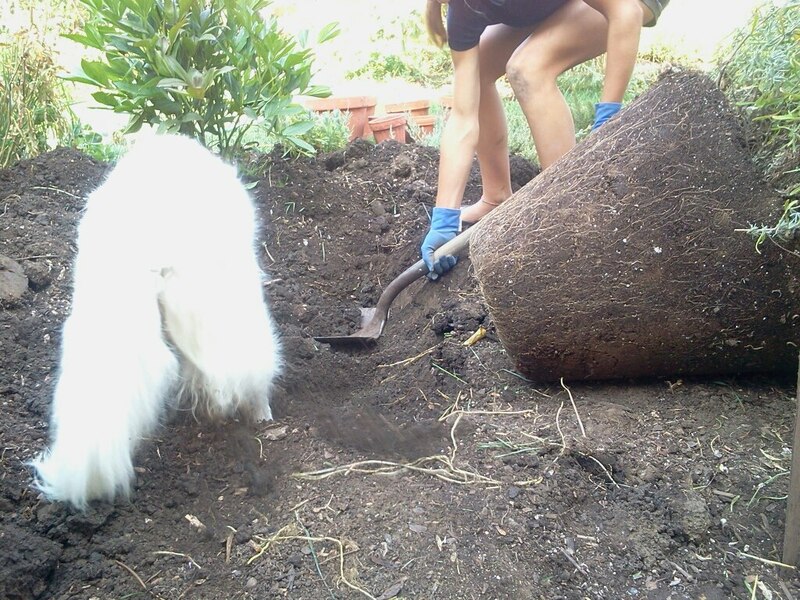 Four hours of digging in the dirt, moving plants, and being outside on a gorgeous day. 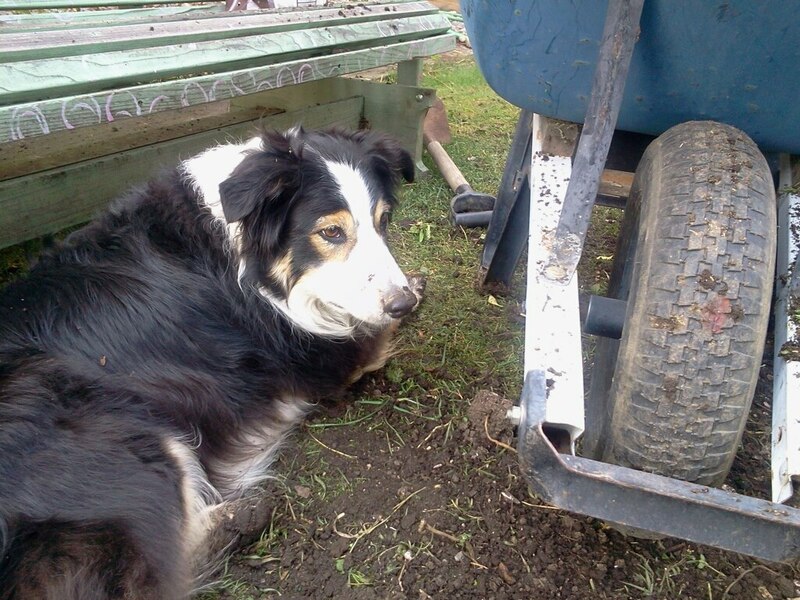 He loves his job escorting the wheel barrel, it’s just that simple. Not a digger, but rather a driver! Dirt is just good for the soul. 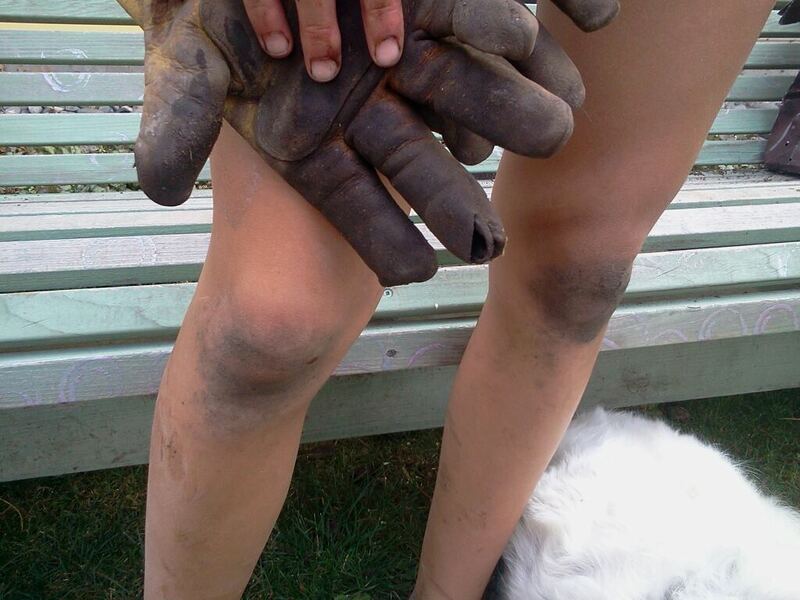 I don’t know of anything more enjoyable than spending an afternoon in the dirt with my kids and dogs. Grounding. 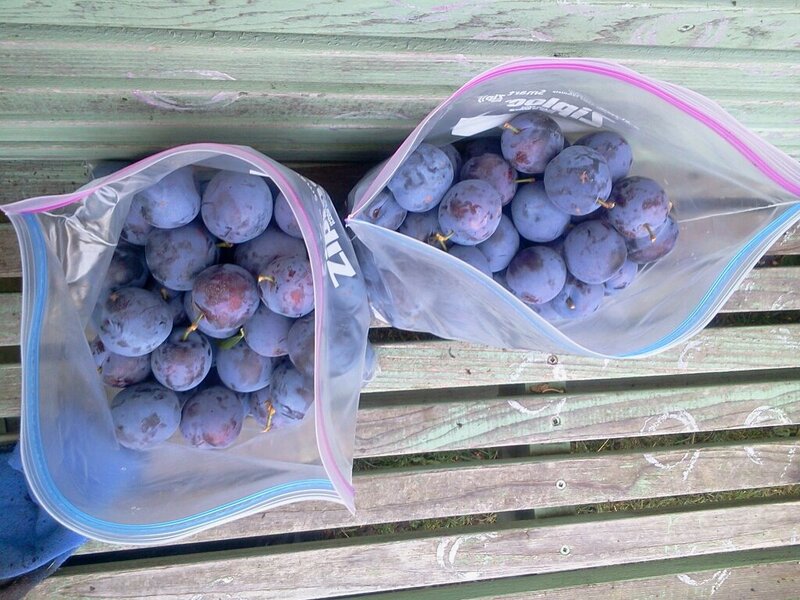 Whoever stopped by today, went home with a bag of the worlds most delicious plums. Woop! My mouth is watering just looking at this photo. Gorgeous color combo, bite size, so sweet and perfect. 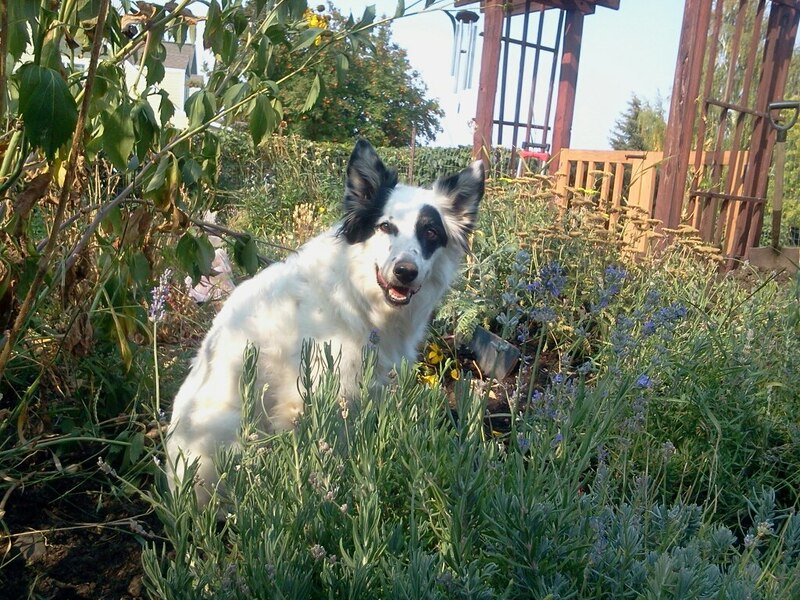 neighbors, and barking, and fence running… oh my! What a great team of assistants you have .It’s nice to have someone who is prepared to get their hands(er paws) dirty. 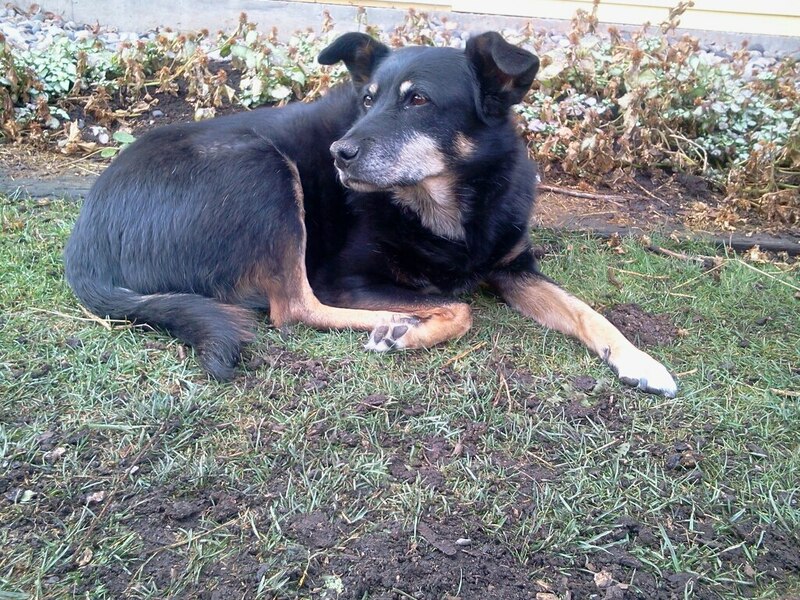 But I’ve got to hand it to Franny…how clever she is to supervise and just revel in the joy of it all. I found a nice place for my Otto Quast lavender and it’s really going ahead now that Spring has arrived. I’m really looking forward to more. And now the bananas are going to start their long journey towards fruiting.I’m working on a plan to outsmart the possums this time around….you know I think they just look at my safeguards and shake their heads at my simple attempts, but I’m ready for the challenge this year ! I’m always happy to share a few pieces of fruit, but these guys take a bite from every piece of fruit the minute it ripens fully. The mandarin tree is almost a lost cause. One day I went to pull off a beautiful looking plump mandarin. And shock horror…it was empty ! Yes, these little possums successfully emptied it out and left the skin almost completely intact. I’m clearly in the presence of a highly skilled possum family. ah, and you have the tropical version of gardening… Some day I will have to try that. We haven’t had any possums as of yet, a couple of racoons over the years, and some field mice. But honestly we lose maybe two to three plums to birds and that’s about it. When they are ripe we eat them straight off the tree. I really enjoyed this article. We have been munching on goodies from our garden all weekend too–. I am going to try to get one of those Royal Mountain Blue Plums if I can find one and was curious about what type of Lavender you feel is the hardiest. I very seldom get it to come back in the spring. We harvested the best onions I have ever grown this fall and had a excellent garlic and swiss chard crop. We also have wonderful brussle sprouts this year–Yum! The Oak gardens off of Nelson is where we got our plum tree from about 10 1/2 years ago… they have a great selection of fruit trees that do well in this climate.